Mass Cultural Council and New Art Center will present the 2017 Mass Cultural Council Artist Fellows Invitational in Photography, Sculpture/Installation/New Genres. Included in the exhibition is Mark Cooper, a multimedia artists who explores the multifaceted layers of life and its interconnectivity through the creation of ceramic vessels to large scale installations will be presenting his work in the show. The installation Aloha – Ola represents my belief in the need for and importance of love, compassion, empathy, harmony, and collaboration. All of the material gains and worldly success attainable are empty if we do not have love, family, friends, and community to contribute to and share with. I see community as global as well as local. The installation consists of signifiers meant to trigger associations and reminders of these considerations. The ceramic objects included in the installation, for example, serve as a metaphor for feeding, sharing, and providing for others. The installation brings together seemingly unrelated—even contradictory—elements, which interact to create a more meaningful and immersive whole serving as a metaphor for the idea that the sum of the parts is greater than the individual parts. The hundreds of fragments making up the sculptural heart represent the complexity of love and happiness and the power from succeeding in bringing it together. These projects explore visual language and visual culture on several levels, addressing ideas about collections, collecting, value, and methods of presentation. First, the work draws on a range of subject matter from construction sites to coral and seaweed, cell biology, from rogue bee’s nests to street life, and includes cultural and art historical references. 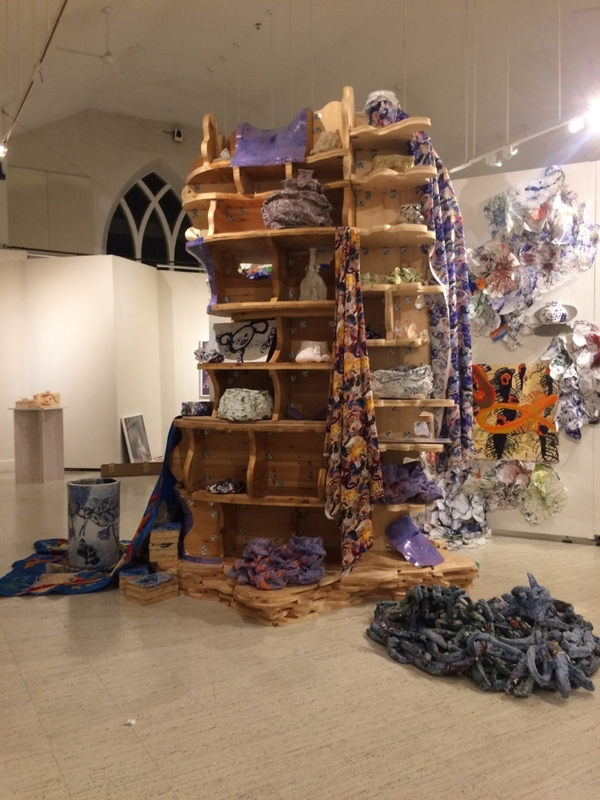 Secondly, there is dialogue between the materials, from sturdy wooden structures to ethereal rice paper and organic ceramics, as well as collage, handmade fabrics, and paintings. On a third level, the installation opens conversations through collaboration with other individuals, including artists, installers, shippers, lighting specialists, curators, and non- art related members of a community. My way of working through assemblage engages viewers differently than linear narrative. In my view it triggers the viewer and engages them in an interactive process allowing for individual associations and conversation very different than a story with a beginning, middle, and end. Through collage, assemblage, and installations I believe viewers will discover unexpected connections, bringing new meaning to each component part. In asking viewers to engage in the dialogue between the forms and influences presented in the installation, my hope is that it serves as a microcosm of life, encouraging an appreciation of nuance and the importance of critical thinking and clear communication in a world that is often polarized. I am interested in systems thinking, and the idea of seeing any given issue as part of a greater interlocking network of challenges. Placing diverse creations in relation to one another in this installation takes away the importance of individual objects for the gain of the ongoing conversation between them. It suggests that the genius idea, in science, mathematics, art, and all disciplines is built on the effort of everything that comes before. I believe there is a need for direct experience and a maker’s movement in a world mostly involved with the Internet, cell phone communication, and virtual experience. Each rice paper drawing, ceramic object, sculptural form, photograph, and painting is created to be a remarkable stand-alone object. They serve as representations of an approach to collaboration in which each individual brings their unique contribution into the mix. When viewers are presented with the opportunity to make connections between objects, it becomes a metaphor for making connections between other individuals and other cultures. For more, see Mark Cooper‘s work at the upcoming exhibition 2017 Mass Cultural Council Artist Fellows in Photography and Sculpture/Installation/New Genres.